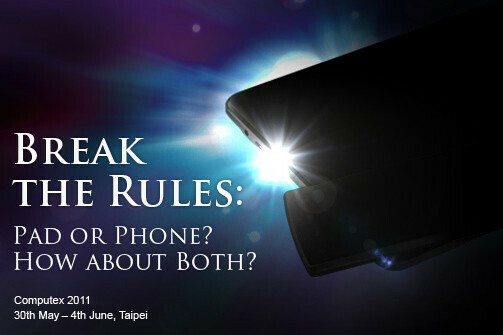 ASUS to lift the curtain over a phone-docking tablet at Computex? Those of you with retentive memory probably remember how ASUS stole the show with a quartet of tablets back at CES in January, but some of them like the 7-inch ASUS Eee Pad MeMO have taken quite a while to ripen. Was it all worth the wait? 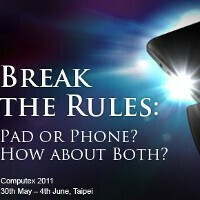 The Taiwanese company promises to give us the answer very soon at Computex which starts May 30th with what looks like the Eee Pad MeMO, but - even more excitingly – it promises to break the rules with a combination of a tablet and a phone. It’s only a speculation based on this very picture, but judging by the arrangement of the slate and the phone, we could well see a phone-docking tablet with the supposed docking station looking somewhat similar to the one on the Atrix 4G laptop dock in terms of design and positioning. While that would be truly rule-breaking, it could also turn out (and that might be more realistic) that ASUS is releasing a phone and a tablet with some kind of Synergy-like software linking the experience on the two. 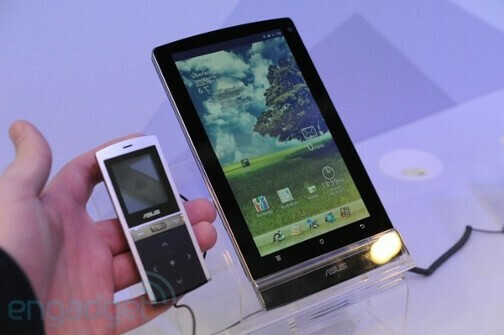 The final guess is that we’re looking at the Eee Pad MeMO bundled with a MeMic Bluetooth handset. What are your expectations about the mysterious pair of devices? Feel free to voice your opinion in the comments below!